Germany, Europe Hi Mom, How are you? Time is moving on. We are over half way on our tour and feeling the pressure and hectic days. I have a cold and am run down. We were able to sleep in today and rest until 2 p.m. Then we'll have free time in Bonn, Germany, and will perform at a Bonner summer festival at 8 p.m. We play Beethoven's 5th, a disco version. It should be interesting to find out how the Bonn audience, the birthplace of Beethoven, reacts to the song. Italy, Europe Hi Mom, How are you? So much has happened. I want to tell you everything but life is moving so fast. We left Innsbruck in the morning and traveled to Venice. We traveled over the highest bridge in the world, through Brenner Pass and saw some of the most magnificent countryside that I've seen – little chalets adorned with gladiolas, neatly sown fields on the mountain side, magnificent mountains some snow covered and a beautiful colour of green everywhere. We passed the Austrian/Italian border and soon the countryside changed. There were still mountains for miles but a castle or monastery appeared on every hill. There were vineyards everywhere. I stayed awake the whole trip to Venice. We stayed just outside Venice called Mezdra. 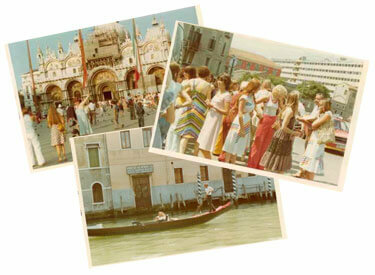 We slept at a Technical School and woke early to tour Venice. The buses let everyone off at a parking lot as Venice consists of canals. We then took a boat trip tour through Venice. The houses are old, large buildings and cathedrals are magnificent. England, Europe Hi Mom, How are you? I got your letters and glad to hear from you. Traveling changes people and most often for the better. You experience a lot, both good and bad. You see different ways of life, from the rich of Baden-Baden and Monaco to the poor but happy French and Irish from the countryside. I can say I had a wonderful time in Germany. Well I'm feeling good but I miss you. I have an earache. When we arrived in Ireland after a rocky 22-hour ferry ride from France, one of our buses would not start. It had to be towed off the ferry. We transferred our luggage to an Irish bus that took us to Waterford. We again changed buses and had to rush to get to Tralee. The highways of Ireland are narrow. Our replacement bus hit a car. We all were fine but the car was a write-off. The elderly man driving the car was very lucky. We had to get off the bus again and crowd on the other two buses. The girls had been through quite a lot this summer, from best to the worst. I'm really proud of them. They performed very well. I was so pleased to hear from you when I got back to Bramley house and glad to hear that Ron and Tom are OK. Keep the faith, Mom. I sure am. I simply love life more than I ever had before. Ta ta for now. Love, Linda. In closing from Linda Purgas: Thanks to Michael Boo for allowing me to write about the Alberta Girls. DCI provides the standard by which we achieve. Alberta Girls achieved. The 1977 Alberta Girls were of an average age of about 16 and a half years-old. There were 100 girls, four instructors and about 12 support staff members. 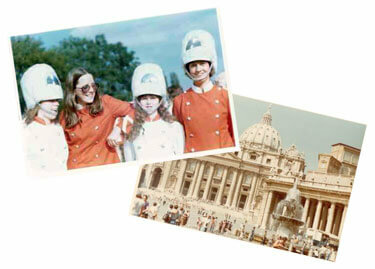 We traveled for 10 weeks to 13 European countries and did more than 50 performances in 1977. These ladies were hard working, performance orientated ladies that were great to watch. Their music was from the heart. 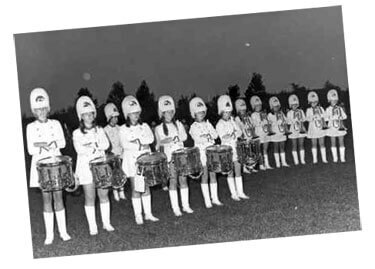 It was a true honour to work for and perform with the Alberta All Girls Sound Spectacular in 1977. Thanks ladies. And thanks to my Mom for being my inspiration. She is 79-years-old in 2006 and it's been 30 years since I aged out, however Alberta Girls gave me the opportunity to march until I was 24-years-old. As of 2006, I am a systems analyst by trade. My oldest son is at law school, daughter in law teaches, middle son a guitarist and youngest is "smart as a whistle." I am blessed by good in my past, in the present and wish everyone the same for the future. Thanks again. Ta-ta for now. Love, Linda.